December holds many winter promises, those of cold weather, the holidays, and winter flowers! According to DFW Flower’s Birth Month Flower post, the other December flower is the Holly! 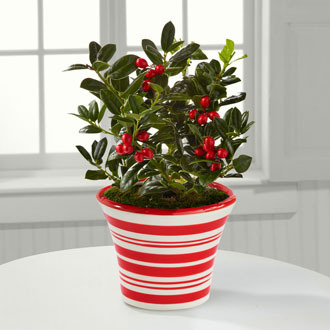 The holly is one of the most popular Christmas evergreens. The holly tree was known to medieval monks as the “Holy Tree” because it was believed to keep evil spirits away. It was also believed to protect a home from lightening. The early Romans decorated their hallways with holly garlands during the mid-winter feast of Saturnalia. Holly later became the emblem of eternal life; the pointed leaves of the holly represented the crown of thorns worn by Jesus; the red berries symbolized the drops of blood shed. Holly also came to represent the biblical burning bush in which God appeared before Moses. According to legend, Holly should be introduced to the house before Christmas Eve and removed on the Twelfth Night. In the language of flowers it is the symbol of domestic happiness. This entry was posted in florists, flower and tagged Adam Nevarez, Andrea Morin, bouquets, Brandy Nevarez, Centerpieces, Christmas, cooking, Dallas, Decor, delivery, DFWFlowers.com, edible flowers, florists, flowers, Fort Worth, holiday, Reception, roses, Texas, Thanksgiving, Wedding, Wedding bouquet. Bookmark the permalink. Whats up. Just wanted to make a swift mention and tell you that I’ve appreciated viewing your blog and will be recommending it to my friends. Keep up the good work! Thanks.